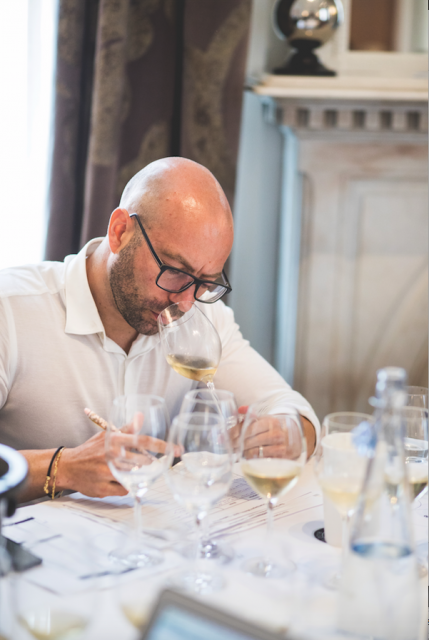 Patrick Schmitt MW brings you a full report from this year’s Champagne Masters, including all the medal-winning wines; an extensive analysis of the stylistic trends, and highlights from the competition – which comprised little-known labels and the most delicious fizz on the market today. Jonathan Pedley MW of Crown Cellars. The aim of blind tasting wines, whatever the category, is to remove all temptation to pre-judge, because, however disciplined one is, there is always an urge to question your perception if you know the cuvée. This of course can work both ways, encouraging one to downgrade something with a lesser reputation, and upgrade something previously celebrated. And if there is one single lesson from this year’s Champagne Masters, where each sample was tasted without any knowledge of its identity, it was that one should be open minded in the search for quality in this region. Or, to put it more bluntly, those who give in to label snobbery could be missing out on some of the best value sparkling wines in the world. I can say this having blind-tasted the likes of Aldi own-label Champagne alongside Lanson, or cooperative-sourced Palmer against Piper-Heidsieck, and seen that the quality, measured in points, and rewarded with medals, is similar in each case with such respected grandes marques. Indeed, this year’s results, more than ever before, show that some of the least illustrious sources of Champagne gained some of the highest scores. In particular, the 2018 Champagne Masters conclusively showed that a good grower-cooperative (those producers who are owned and run jointly by its members, who are growers), can be the go-to for the best quality-price ratio in this sparkling appellation. Although Champagnes made by cooperatives are often believed to be of lesser quality, our tasting in August proved that such producers can achieve outstanding results, and even make superior cuvées than the famous Grandes Marques, despite the lower prices generally charged for cooperative brands. For those who know the Champagne region well, however, such an outcome may not surprise, with cooperatives being major suppliers of grapes and wine to many well-known names in the region, who own few vineyards themselves. Not only that, but, unlike grower-Champagnes, who make fizz from just their own holdings, the cooperatives can source from a large area, and tend to select the best grapes and wines for producing their own branded Champagnes. This gives them the chance to blend wines from across vast swathes of Champagne, vital in the strive to create something consistent in style, and complex in character. But this isn’t the only reason why cooperative fizz is good at present. It also follows extensive investment by big grower-groups in winemaking facilities – as we’ve reported before, the major spending in Champagne over the past decade has been on wineries, as producers realise the importance of state-of-the-art equipment in the constant battle to remain a quality leader in the increasingly competitive world of sparkling wine. So let’s look at the evidence in support of cooperatives as a supply of high-quality Champagne. Among the seven Champagnes that gained a Gold medal or higher in the Brut Non-Vintage category of 2018’s Champagne Masters were two bottles that hailed from cooperatives. Rubbing shoulders with the likes of Veuve Clicquot Yellow Label and Charles Heidsieck in this year’s Champagne Masters were Champagnes Palmer and Pannier, two first-rate brands owned and run by groups of growers. Such Champagnes were placed ahead of more illustrious labels, such as Champagnes Pommery and Laurent-Perrier, which come with higher prices too. Meanwhile, taking home the ultimate accolade in the vintage Champagne category was another cooperative label, with Champagne Castelnau achieving a near-perfect score for its release from the 2006 harvest. Within the same category was a further stand-out wine from a cooperative, with the 2008 vintage from Champagne Chassenay d’Arce – a growers’ co-operative based in the Aube – picking up a Gold. Then, among the blanc de blancs, we had another master from such a growers’ organisation, which was awarded to the sample from Champagne Collet – the brand of a co-operative Cogevi (Coopérative Générale des Vignerons). This was deemed of similar brilliance to Pommery’s blanc de blancs, while coming close to both these pure Chardonnay Champagnes was Castelnau’s 2005 vintage blanc de blancs, which gained a gold, along with just one other house, Canard-Duchêne, for its Charles VII La Grand Cuvée. Finally, one of the highest-scoring Champagnes of the day’s tasting – which saw almost 200 bottles sampled blind by highly-experienced judges – was also from a cooperative. Gaining 97 points out of a possible 100 was the Egérie de Pannier 2006, the top cuvée from Pannier, which was praised for its wonderful combination of complementary flavours, from lemon and honey, to toast and grilled nuts, along with an uplifting, lasting and very fresh, dry finish. Costing £75, the Pannier prestige cuvée is far from cheap, but good value relative to other special blends in this top-end Champagne category, from Dom Pérignon to Cristal, which can retail for almost double the price of the Egérie. Another cooperative Champagne that performed well in the 2018 Champagne Masters was a prestige cuvée from Union Champagne – with its Orpale 2004 gaining a Gold. 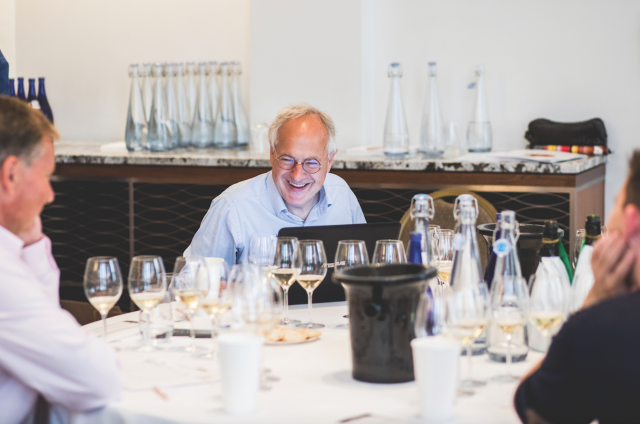 Then there was Nicolas Feuillatte, Montandon and Jacquart, which each of these cooperative producers picking up Silver medals for a range of cuvees – an impressive feat considering the strict, if fair, nature of the judging in the Champagne Masters. But, while the cooperatives showed extremely well, that’s not to say other houses performed poorly, and we had several stand-out Champagnes among négociant brands, big and small. Like last year, Charles Heidsieck wowed, retaining its position as the most outstanding Brut NV in our tasting, and, considering almost every major marque was included in the competition, one can also say that this house is making the class-leading Brut on the market today. Great brands and smaller names were both present among the golds, and, aside from the cooperative brands mentioned earlier, Palmer and Pannier, the great Brut NVs also hailed from the mighty Veuve Clicquot, and Piper-Heidsieck (interestingly for its first-rate demi-sec), along with more modest houses Henriot and Cattier. Concerning drier styles, the Extra Brut category, which can be the source of slightly hard-tasting cuvees, was this year home to a couple of excellent Champagnes, a sign that when the blending and maturation is carefully done with a low dosage in mind, the results can be highly successful. Taking home a Gold was Piper-Heidsieck’s Essential with 5g/l dosage, but, compared to its Brut, an extra 18 months spent ageing on its lees to bring a compensatory roundness to the cuvée. It has more precision than the Brut, and plenty of toasty richness from lees ageing, making it a great example of a very dry Champagne. A surprise newcomer in this category was the négociant house Brimoncourt, a historic Champagne brand ressurected in 2009 by an entrepreneur from the region. Its Extra Brut, despite just 2g/l dosage, had a wonderful creamy mouthfeel from carefully sourced ripe Chardonnay from the southern end of the grand cru slopes of the Cotes des Blancs. If you want almost bone dry NV Champagne, then few are better than this. Within the vintage category, aside from the excellent samples mentioned above from cooperative brands Castelnau and Chassenay d’Arce, one of the best-value and most complete cuvees came from Moet & Chandon, specifically its brilliant achievement with the generous 2009 vintage, where ripe yellow fruit complements this house’s more ‘reductive’ style, complete with notes of grilled nuts and roasted coffee. Star performer, but at a higher price, in the vintage category was Charles Heidsieck, proving that this house is no one-trick pony, and can achieve Master-quality in a range of categories. Not far behind were delicious and ready-to-drink single-harvest Champagnes from Pommery, Piper and Delamotte, along with a wonderful rosé vintage, hailing, again, from Charles Heidsieck. As for years that performed best, a broad range of vintages gained Gold medals, but both the ripe 2006s and more structured 2008s did notably well, with a slight preference among the judges for the former harvest, which is showing more seductive results now, depending of course on the handling. In terms of further styles, having already mentioned blanc de blancs, it is important to stress the quality seen this year in the rosé category. 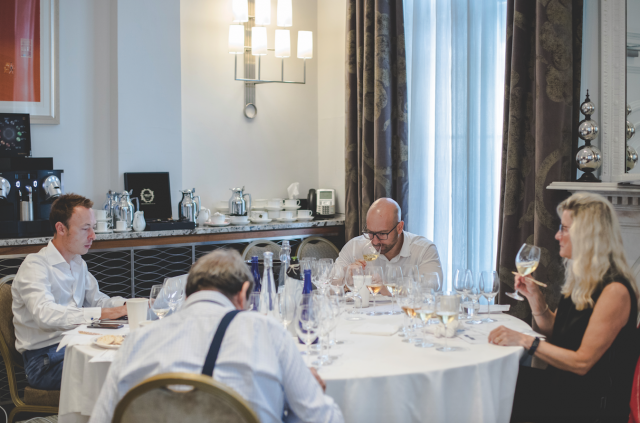 At the top end price-wise the judges were delighted by the pretty, fruity, and refreshing results from Perrier-Jouët in particular, although Henriot and Henri Giraud both impressed. At slightly lower prices, Veuve Clicquot is making full use of its Pinot Noir winemaking expertise by making a consistently first-rate rosé, although so too is Charles Heidsieck, along with Moet, albeit in a slightly lighter style. 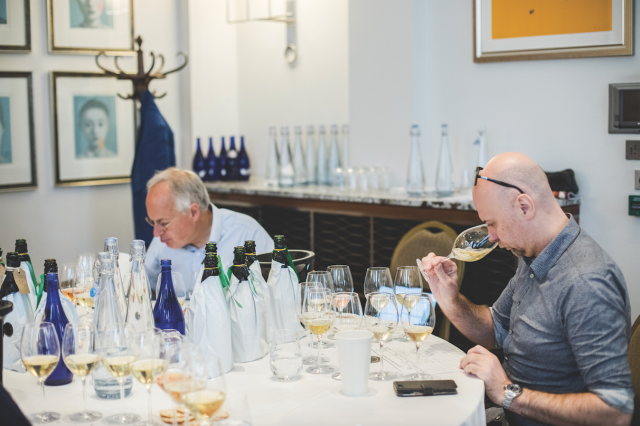 At for the very pinnacle of Champagne, the prestige cuvee category, this year’s tasting prove that such a descriptor is worthy for pretty much all the most expensive expressions from a broad range of producers. We have already mentioned the brilliance of the Egérie de Pannier 2006, but also proving outstanding this year was the Amour de Deutz Rosé from 2008 – a beautifully pale pink Champagne with a lovely balance of brightness and creaminess. But, although there were a selection of absolutely brilliant cuvees at this top end, there was one highlight fizz, and, in my view, the best Champagne on the market today. This is the 1998 vintage of Piper-Heidsieck’s prestige cuvée called Rare, which is available today in magnums only, with a retail price of £375 – making it pricy, but by Champagne prestige cuvée standards, far from outrageously expensive. Achieving an average 98-point score when myself and three other judges sampled it blind, I wasn’t alone in declaring it an exceptional fizz – and even asked the competition organiser, Chloé Beral, to stopper the cuvée immediately, so I could try it later on that same day (and was subsequently delighted to discover it came in a large format, and tasted even better a touch warmer). Why is it so good? I believe the fact it comes in magnums plays a part, giving the wine a more youthful taste and sensation than one might expect for a Champagne that’s now 20 years old. But it is also the skill of the Rare cellar masters Régis Camus and late Daniel Thibaut, as well as the quality of grape sourcing, and the nature of the 1998 vintage, which has undergone a revision upwards in reputation, unlike the more famous 1996 harvest of that decade. So what does it taste like? It offers an intriguing sensation of a Champagne that’s evolving, but still zesty and youthful; a fizz that’s broad and creamy, as well as tight and cleansing. And while it has the golden appearance of a developed Champagne, it doesn’t exhibit oxidative bruised apple characters that often plague fizz of such an age. Rather, the Rare 1998 has more ‘reductive’ characters of smoke, coffee and toast, no doubt from the extended period this wine has spent ageing in contact with its lees. In combination, drinkers can expect aromas of almond, cappuccino and vanilla, along with fruit flavours on the palate from dried apricot to orange and lemon zest, complemented a persistent toasty finish. Still tangy, with plenty of forceful but fine-textured fizz, this is a Champagne that’s perfect now, but still lively enough to mature further. Patrick Schmitt MW, Andrea Briccarello, M&S winemaker Sue Daniels and Jonathan Pedley MW. Nevertheless, to finish with the topic at the start of this article, the value for money on offer among grower-cooperative brands, even at the priciest end of the scale the coops impress. Indeed, with Pannier’s Egérie 2006 costing £75, one could have five bottles of this prestige cuvée for the same price as a single magnum of Rare 1998 – a thought that makes the former all the more tempting, especially when one considers that its final score in the blind tasting was just a single point lower than the top Piper cuvée. But, really the lesson here, as noted at the outset, is not to worry whether the Champagne comes from a famous brand, large-scale cooperative, or petite maison. While image and appearance are of course important, particularly for gifting with Champagne, when it comes to finding the best quality for the price, one shouldn’t give way to prejudice. Nevertheless, you need a guide, and that’s the role of blind tastings using experts in their field. So, dare I say it myself, when topping up on Champagne over the next 6 months, use these results as your guide. 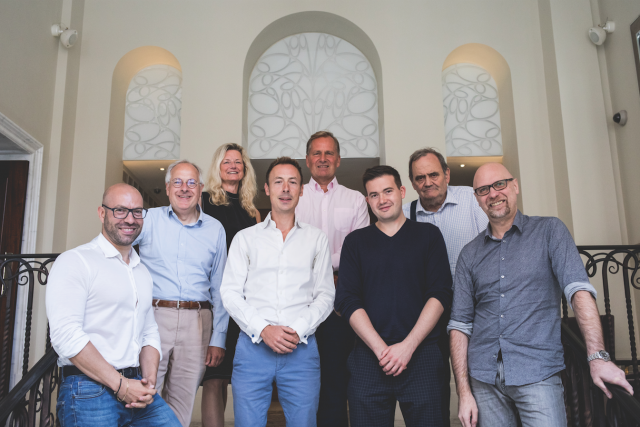 Top L-R: Sue Daniels, Simon Field MW, Bottom: Andrea Briccarello, Jonathan Pedley MW, Patrick Schmitt MW, Clement Robert MS, Michael Edwards, Roberto della Pietra.